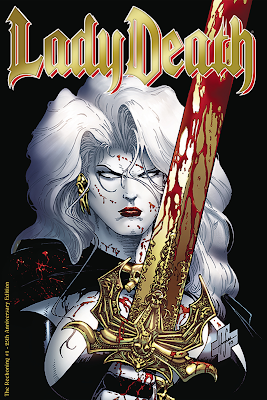 This 25th anniversary edition of the legendary Lady Death: The Reckoning #1 has been intimately re-mastered: re-scanned color pages, lettering restoration, and features a never-before-seen behind the scenes sketchbook section, interviews with Brian Pulido, Steven Hughes, and Jeson Jensen, and little seen art. 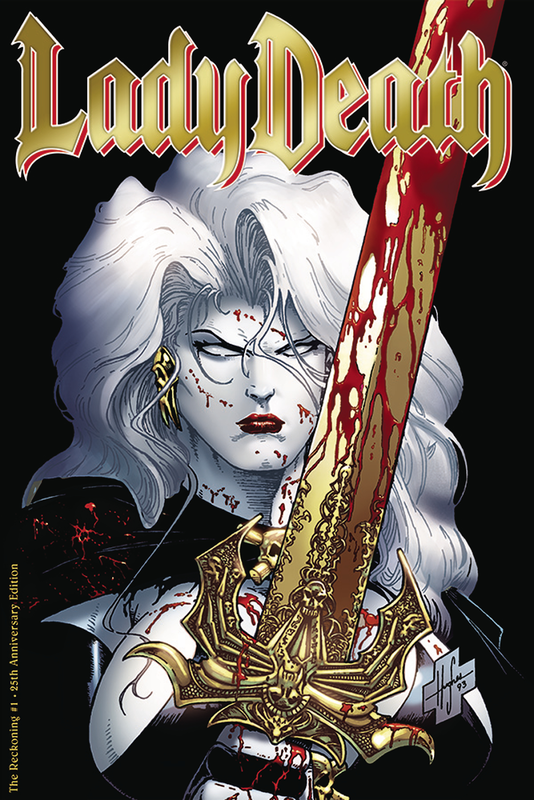 Learn how a medieval girl named Hope renounced her humanity to save her mother's soul in Hell, only to be transformed by insurmountable circumstances into Lady Death, the diva of death! Heck of a cover. Nice drawing. I remember this book being on Wizard Magazine's Top 10 Hot Comics list for the majority of the 90s during the "Bad Girl" comics craze.